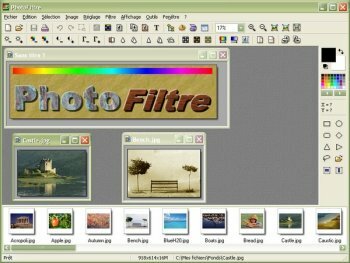 PhotoFiltre is a complete image retouching program. It allows you to do simple or advanced adjustments to an image and apply a vast range of filters on it. It is simple and intuitive to use, and has an easy learning curve. The toolbar, giving you access to the standard filters with just a few clicks, gives it a robust look. Excellent graphics editor. Does 90% of what PhotoShop does at 10% of the program size. Extra point for being a no install portable program. I almost took a point off for the TWAIN interface not playing nice with Win 7 X64, but was able to run it successfully as an XP app. I hope it will be made fully compatible soon. 1/2 point off, still a great program! This is an excellent replacement for Windows Paint. So many more features and yet it starts up just as fast. Rock solid, amazingly well written and a pleasure to use. 6 stars. Studio is also well worth the money. Nice, but Brian, much of the development has gone into Photofiltre Studio, where all the new goodies can be found. Nice to see a little bit of development happening again, after a longish period when I thought the author had given up on this freeware version in favour of the shareware one (PhotoFiltre Studio). XOX XOX XOX smack, slurp. Love at first sight. Excellent. What a fine program -- for free. I truly wish it would be available for my Mac as well as my Windows computers. It does what it claims to do, and very well. It's actually fun to use. Despite the fact that I am a die-hard Photoshop CS2/CS3 fan, I've been trying VERY hard to use this program for all of my graphical needs. PhotoFiltre is just one of those programs that you love when you first open the program. Why do I love it so much? Simple, fast and high quality results. Excellent work. Congratulations. You can use Irfan View and Photofiltre together. In Irfan View, go to Options/Properties, choose the Misc. 2 tab and select Photofilter as your external editor. The result is powerful and fast. You can use the external editor option in the Files drop down menu or add "Open with external editor" and a bunch of other features to the mouse context menu by checking "Use context menu for mouse (default scrolling)" box in the Misc 1 tab. For basic "one click" edits - I'll use Photofiltre before I bother with Photoshop or Fireworks. Only a pity Irfan View and Photofiltre couldnt get together for the best of each. Free, stable, big toolbox - a winner. This program absolutely rocks ! Been using it for several years now, and haven't found a photo application yet that it won't handle. THANK YOU, Antonio !